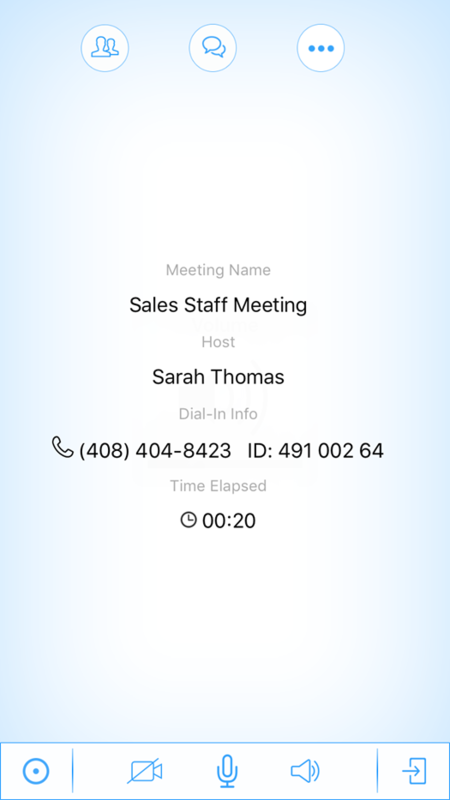 When you start or join a Conférence Virtual Office, the meeting controls in the interface are split between the top and bottom of the screen, with meeting information displayed in between. Tap to view or invite participants, or to have a one-on-one chat. If you are a host, you can tap next to a participant to mute them, or tap Mute All to mute all participants. Tap to open a group chat with all meeting participants. Select from the available audio channels. If you are viewing shared content, you can switch between Home and Content views. If you are sharing video, you can switch between Home and Video views. Tap to record meeting audio. Tap to stop recording. Audio recording is only available to hosts. The icon appears grayed out if you are not a host, or if nobody has joined meeting audio. Tap to turn your camera on. Tap to turn your camera off. Tap to mute yourself. Tap to unmute yourself. Tap to open a menu of audio output options. Tap to leave the meeting. Hosts can choose to end the meeting for everyone, or leave without ending the meeting.